This post is about Renee Richards, not my favorite Canadian blogger, but y'all know I think Ms. Martin at Womanist Musings is all that and three bags of ketchup flavored chips. 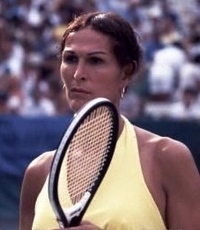 I just finished watching the ESPN documentary entitled Renée, about her life, becoming a reluctant trans rights spokesperson and just trying to live her life after the television cameras and the intense public attention has moved on. It also brought back some memories for me, especially during Meghan Stabler's segment of the documentary. I was a teen in the 70's a year from entering high school when Renee Richards burst into our collective consciousness and our headlines.back in 1976. I was a high school sophomore when she won her lawsuit that gave her the right to play in the 1977 US Open. 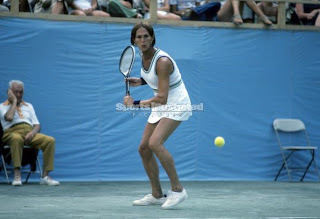 As someone who was struggling with those same gender issues at the time and was trying to define and figure out who I was, what was going on and why I felt the way I did, she was mine and it seems like just about every transwoman who was a teen in the 70's lightbulb moment. Since I grew up in Houston, those of us who lived there already had a trans shero in Toni Mayes thanks to her successful 1975 lawsuit stopping HPD from using the anti-crossdressing law to harass her that Phyllis Frye took down five years later. And seeing Renee's story on screen brought me back to thinking about my own trans journey and specifically my feelings about my high school days. Was more than a little frustrated about being on the wrong gender team at the time. I was envious of many of my female classmates and watching them blossom at various speeds into their own burgeoning femininity and feeling like I was alone, in the middle and not part of anyone's team. I didn't know at the time that I wasn't alone. I had a classmate going through the same journey from the transmasculine side. I had more questions about the future than confident definitive answers and although I was unaware I was doing it at the time, was pushing women away who wanted to get to know my 'twin' on a more intimate level. Toni Mayes, Phyllis Frye and Renee Richards were my torches guiding me to the beginnings of knowledge about trans issues. It was the first clue it was possible to transition and still have your hopes and dreams at the same time of a positive life. It would take me a few more years to sort the issues out, face my fears, summon the courage to do so and finally handle my trans business. Back to the documentary. It was a nice blast from the past and a reminder of how far we have come in some ways, but another reminder of how far we trans people still have yet to go in terms of societal acceptance. And it was interesting to see how the life of a reluctant trans pioneer turned out.